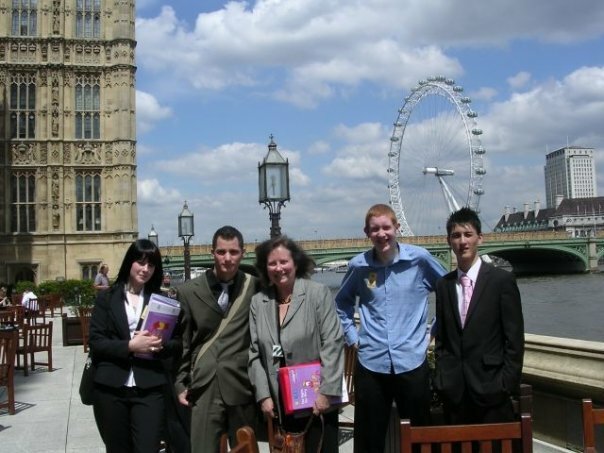 I was lucky to be one of 4 young people to have the chance to go to London and to push the issues of getting voting rights for those aged 16 and 17. We presented Julie Morgan MP with a copy of the welsh young peoples reports on Rights from the united nations in the hope our result of over 80% of over 12,000 Young people believe that the voting age should be lowered would be able to aid her in the debate before the vote on Friday 6th June 2008. If passed at this stage we are on way there in achieving our goal as not many EDMs pass this point. The bill (EDM) will go to what is known as committee stage in where the relevant area “specialists” will look over the proposed bill and question its motives. Once the committee is happy the bill then is reported back to the House of Commons for another vote and is then passed for the same process within the House of Lords , then it is given the royal assent (it becomes law and we would have achieved our goal). 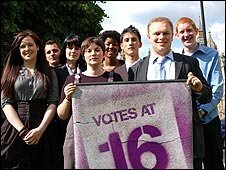 We then met up with other organisational representatives in what is known the votes @ 16 coalition in where youth organisations across the UK is campaigning for the same issue. 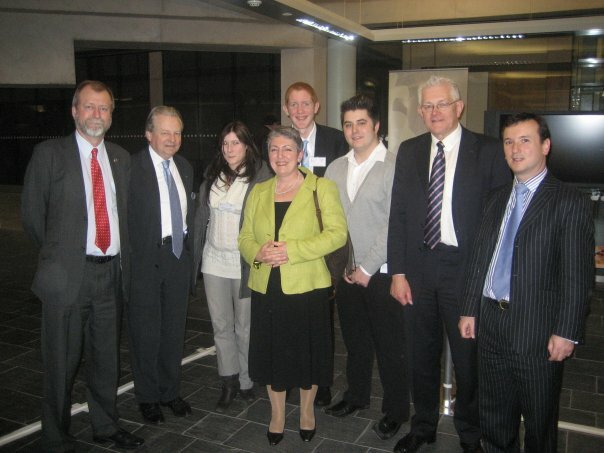 We went through speeches that were to be presented within a Commons committee room. We had discussed issues that may arise at this stage and were informed how to react to the press that was waiting for us. Just opposite parliament, there is a “media lawn” it is always packed of reporters and today was our day to join in to aid our campaign as well as pictures with Julie Morgan with a copy of the printed proposed bill. I was interviewed by the BBC in why the age should be lowered which I felt went well as was not as nerve racking as I thought it would be. The committee room was packed both of young people and adults (including MPS and Peers) we heard the speeches from MPS in support of the EDM and were keen to inform us how we can gain more support. The young people spoke after and then the floor opened to questions in which I asked “Are MPs afraid of young people already and feel threatened politically if the age was lowered to vote”. Many other questions were raised and answered by the panel of MPs from Plaid Cymru, Labour, Conservatives and the Liberal Democrats as well as the young people. We had a guided tour of parliament, which was a good start to the day. Although the fact that Craig and myself had been on tours of Parliament before, we had still learnt plenty this time round. It was important to find out the contributions to the House of Commons from the commonwealth countries to ensure democracy can continue effectively at what has been its home for centuries. Many participants were pleased to find out what there country had provided as gifts with pride. Wow I had never known there was a tunnel from parliament to go underneath the road to the other side, it lead from the old building to an unexpected new state of the art parliament building for members. Most of the morning was done within the Atlee Suite. In the first workshop we found out what the CPA is and what it does in and that we found it promotes democracy equal access to human rights. It was interesting that countries joined on a voluntary basis and all are of equal status. There is a misconception that countries were forced to become members after the empire ceased to be. The work that the CPA undertakes to promote human rights as well as ensuring issues such as the environment can be tackled was an eye opener for me that the organisation was used in this way. In the second workshop we had two MPs talk (Kate Hoey and James Paice) about there role as an MP and found that it was a very demanding responsibility which must be a very hard job. They also answered many questions including the reasons why young people do not vote as well as the European Union. Within the third workshop we had the pleasure to find out the work of High Commissioners contains and found that the work can be shared amongst other commissioners of the same country. We had a talk by DR Michael Refalo from Malta and MR Annan Arkyin Cato from Ghana. They had managed to answer questions about the new immigration laws regarding the point system in stating that before the years of the Thatcher government, commonwealth citizens were able to go to university at a lower cost than other foreign countries but unfortunately ceased due to Thatcher policy change, which is a shame and can be seen as losing the important ties we have but thankfully they are still as strong as ever. The fourth workshop was from a parliamentary clerk explaining more about parliament but also what happens in the background of the working of the UK Parliament but also the importance of political neutrality which must be very hard regarding certain issues. The Observance was the first time I had been inside the Abby. I found the Abby was richly decorated in history and culture. The service was attended by Her Majesty Queen Elizabeth 2nd and the Duke of Edinburgh, as well as other distinguished guests. The service was rich in music and celebrations including opera, Haka by the Māori tribe, and the singing of African children as well as the sound of a rainforest which was remarkable and will take with me for life. We heard a message from the Queen about how important it is to look after our environment as well as many other religious leaders. The service was attended by many which left with an ambition to ensure fairness to all and help each other in the struggle to help our environment. The reception was packed full of dignitaries from all across the Commonwealth to be in the presence of the Queen. While we (the young people) we had come across the party entertainer in regards to Lord Jenna performing magic tricks but also the chance to speak to the Queen in which he asked her to talk to us in which I had managed to speak to her briefly about myself and my future as well as she wishing me the best of luck which I will take with me with more enthusiasm than before. I also spoke with the President of Uganda who told me about his country which was fascinating to learn about the difference of cultures but also the feeling inside me that we should help these countries more. I spoke with many other High Commissioners learning about their countries and me sharing culture from Wales. I would like to thank those in the CPA Wales Branch who made this possible as well as the linking of other countries and meeting new people who in turn became friends who are in contact with each other. 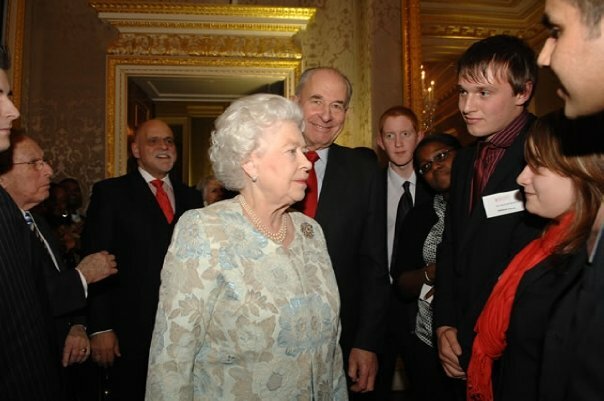 The chance of meeting the Queen is one I never thought that I may have and I am pleased to have done so. I have come away from the event gaining new experiences but better understanding of the Commonwealth and its memberships but also to the size was bigger than I expected. I will go back to Wales and tell others of my experience, but also how important the Commonwealth is and that we should strengthen our links as much as possible. I felt so unprepared in the fact that I had not been taught about commonwealth in school and I therefore feel that it is important for the Commonwealth to be taught in school (and Welsh Bac) in order to ensure our links remain along with the importance that they have helped us in the past but also that we need to help them now in order for them to be environmentally sustainable . I would like to recommend young people from Wales to attend this fantastic opportunity in future in which they may receive a brilliant life experience in which never to be forgotten just as I have done. I believe that If people had to pay more for bottles of drink and once returned to recycle get that money back. A scheme like this is in current existence in Germany where bottles of pop are priced at 2 Euro but once bottle is returned the individual can either get 50 cents back or 50 cents off the next bottle. I also believe from observing sales assistants of all ages in the way they pack bags in where many bags are too big for the small amount of goods needed to pack and would suggest that attention in teaching them how to pack and into what bags could also help individuals use less carrier bags, therefore having a smaller carbon footprint.